You’ve probably heard of high-intensity interval training, a hot trend among both athletes and amateur fitness folks alike. High-intensity interval training (HIIT) is defined by short bursts of intense exercise broken up by short periods of downtime for recovery. There are several key benefits of HIIT, including accelerated fat loss, improved cardio performance, and lean muscle development. HIIT can offer something for just about everyone, whether you’re looking for improved body composition (i.e., more muscle and less fat) or boosted athleticism. That being said, there is a right way and a wrong way to go about high-intensity interval training. Done the wrong way, HIIT can result in injury and other downgrades in performance such as inadequate recovery. If you want to reap the awesome benefits mentioned above, you need to make sure you’re going about HIIT properly. Keep reading to find out our key tips on how to get the most out of HIIT while avoiding the most common pitfalls. One of the biggest mistakes people make when performing HIIT exercises is focusing on a single muscle group. For example, slamming your way through a set of biceps curls followed by a rapid-fire triceps set. This is not what HIIT is for. HIIT works best with full body exercises that accelerate your heart rate (for example, jump roping, bodyweight or lightweight squats, etc). There’s nothing wrong with spending some extra time on a particular muscle group, but if you are isolating muscle groups (like in the biceps/triceps example above), you need to do your sets in a slower and more controlled way than real HIIT requires. Additionally, you will want to mix up your full-body exercises to achieve a proper HIIT workout. Work in exercises that challenge your body in different ways. Some great choices to mix into HIIT include sprints, jump rope, mountain climbers, and rowing (on a Concept 2 or similar rowing machine). Making a note of your exercises on the calendar will also help you keep track of what you have been working on and help you find balance. HIIT workouts require loads of energy to complete, which is why you shouldn’t limit your nutrition. Individuals who are in a hurry to lose weight may think they need to cut way, way back on their caloric intake, but unfortunately this results in lower energy levels. A better option is to reconsider the types of food you are eating and make better choices that provide enough nutrition to support your energy levels. Reduce the amount of high-sodium, high-sugar and processed foods in your diet and replace them with healthier choices such as lean protein, fresh vegetables, fresh fruits, and whole grains. A preworkout meal is also a great idea. 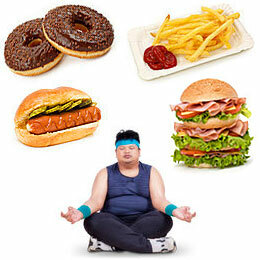 An hour before you head out to the gym for a session of HIIT exercises, have a healthy snack or a small meal. 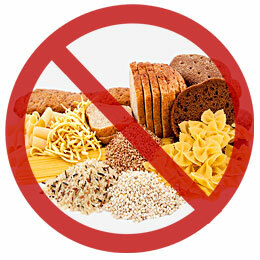 Be sure to include both protein and carbohydrates. This will keep your energy levels up during your intense workout to come while providing your body with the nutrition it needs to build lean muscle and burn fat. Sadly, many people jump into overly-intense HIIT before they are ready and get injured. Strains, sprains, development of muscle imbalances, and exacerbation of posture problems are all too common among beginners doing HIIT. Never sacrifice your form in the name of intensity! Make sure you completely understand the proper way to execute each exercise before throwing yourself into it. If you are too tired to do the exercise with good form, STOP! Rest until you can continue with good form. You will not be able to build muscle and lose fat if your body goes down for the count due to badly-performed exercises. Yes, it’s possible to do permanent damage that requires surgery and physical therapy during HIIT drils. Even if you don’t do permanent damage, you’ll lose valuable time that you could otherwise devote toward your fitness as you recover from pesky, avoidable injuries. It’s just not worth the risk. If you are in doubt about your form, ask a trainer to help you out! One of the most important nutrients for bodybuilders, HIIT enthusiasts, and other athletes alike is protein. 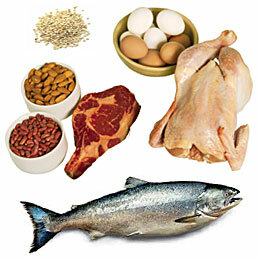 Protein is a key player in a number of bodily functions, one of which is the repair of damaged and torn muscle fibers. When you perform HIIT exercises, small tears will develop in your muscles. This is essentially what creates that distinct ‘soreness’ that so many people experience after lifting weights. The good news is that you can encourage faster recovery and more efficient muscle building by consuming more protein in your diet. Whether it’s from meat, fish, soy, or whey protein shakes, most people could afford to bump up their daily protein intake. Although you will hear different protein guidelines here and there, a simple guideline that is also easy to follow is 1 gram of protein for every pound of lean body mass. Lean body mass is the weight of your body minus the fat. So a 160 pound person with 20% body fat would have about 128 pounds of lean mass, and therefore would do well to shoot for about 128 grams of protein per day (especially on workout days). It may sound counterintuitive, but rest and recovery are absolutely essential to getting good results from your workouts. Of course, you want to achieve amazing results as quickly and efficiently as possible. Just know that HIIT requires adequate downtime between workouts in order for the body to fully recover and rebuild. Otherwise, you’re just continually tearing yourself down without allowing time for your body to rebuild. Especially if you’re a beginner, HIIT every single day would NOT be a good idea. A good rule of thumb is to rest 48 hours between intense full-body HIIT workouts. You can still perform some basic cardio workouts on your ‘off’ days, but you should avoid lifting heavy weights and performing other HIIT workouts. If you’re just mixing in some HIIT drills here and there into other weight training or cardio workouts, you can get away with a higher workload in terms of the other exercises you’re doing. No matter what workout style you choose, it’s best practice to take one day per week completely off your fitness pursuits. Gentle activities such as walking and stretching are excellent for these recovery days, just avoid anything too heavy-duty. When properly utilized, high-intensity interval training is an amazing tool to get in great shape. We hope this DO and DON’T list is a helpful starting place to point you in the right direction. To get the most of out of this fantastic form of training, you will of course also want to be persistent and consistent with it. Like anything, consistency is key for achieving results. With continued and correct use of HIIT, it’s possible to achieve new level of fitness that is beyond the reach of traditional methods of exercise.